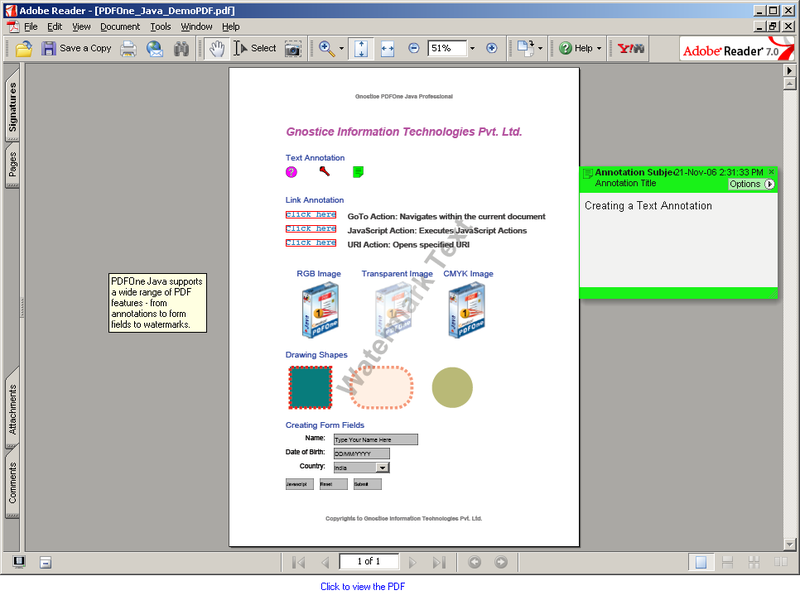 Gnostice PDFOne Java is a library for developers to implement PDF based software solutions. PDFOne Java provides a rich set of APIs to create, manipulate, view, organize PDF documents, optimize PDF documents, process PDF forms and perform other PDF document related tasks from within your Java applications. PDFOne Java is a powerful PDF creation, viewing and management library for the Java platform. PDFOne Java supports creation, filling and reading of PDF forms, viewing, printing, compressing, securing, appending and merging of multiple PDF documents, stamping, setting bookmarks, and many more functions that can be performed on PDF documents.